There are times when you might want to know what life has in store or to get an idea as to the direction your life might be taking. It could be questions about a career or concerns about a relationship. 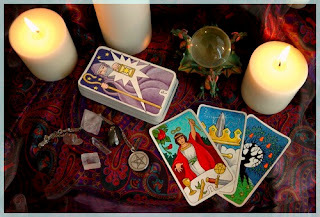 There are psychics you can call on the phone who can give you a bit of insight as to what you might be able to expect in your life with only a bit of information from yourself offered. When you talk to a psychic by phone, keep in mind that the person won't give every detail that you want to know. The psychic probably won't even be able to give a direct answer to something that you ask, only an indication that you can read into, such as a direction of where your career might be headed. It's up to you to use the information in the best way that you see fit as it relates to your life. Prepare your mind mentally for the reading that you're about to hear. Some psychics will use cards during the reading, but you might not know what the person uses since you're on the phone. Spend some time in the days before your reading to clear your mind. This will make it easier for the psychic to get an understanding of your life and allow you to be a bit more receptive to what you hear. While you're on the phone, try to sit in an area where you're going to be relaxed. Turn off your television and other electronics. You should also call when no one else is at home so that you have a quiet environment without a chance of interruptions. It's common to be nervous. The psychic might tell you things about your family and things going on in your life that you don't expect. Try not to let your nerves get the best of you as you listen to what is said. You want to ask the right questions during the reading. Avoid asking questions that will give an answer with one or two words as this will shorten the reading and lead to nowhere with answers to questions that you have.